Hillsborough County Commission meeting, Wednesday, Dec. 5, 2018. The Rays need to give St. Petersburg notice of its future plans by Dec. 31. Hillsborough County says it needs three or four more months. 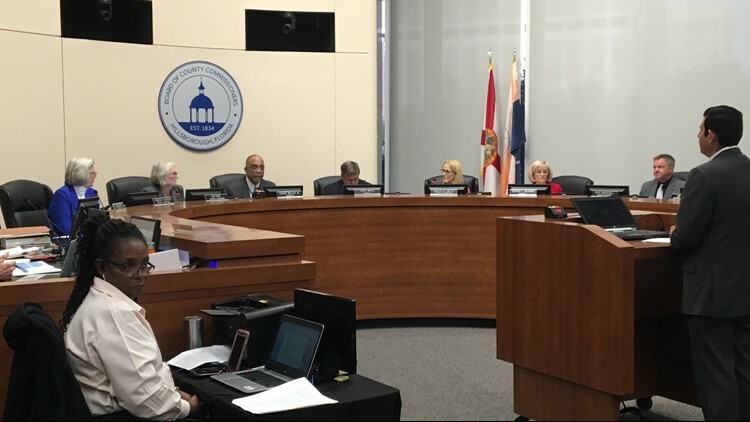 TAMPA, Fla. -- Hillsborough County commissioners got their first significant public update on the ongoing saga to build the Tampa Bay Rays a new stadium in Ybor City, but the path to a new park still appears to be an uphill battle, both financially and politically. County Administrator Mike Merrill said the team is going to need to put up at least $450 million, with hundreds of millions more coming from private developers. You can read about the framework of the deal in 10News’ report from Monday. Just as significant: Merrill said the county won’t be able to iron out a deal with the Rays until the spring and the team will need to obtain an extension from St. Petersburg. The team’s three-year negotiating window with Hillsborough County ends on 12/31. St. Petersburg Mayor Rick Kriseman tells 10News the Rays have not yet approached him about an extension to their Memorandum of Understanding, which requires the team to give St. Petersburg notice by the end of the year if they wish to leave Tropicana Field for Tampa. Merrill said the Rays have not yet responded to his framework offer, sent to the team on Friday. The $892 million price tag for the Rays park also did not include land acquisition, which Merrill said would increase the cost of the project by an unknown amount. He also said no negotiations have begun yet, because so much of the funding would come from federally-subsidized “opportunity zones,” which the IRS had not written new tax rules on until October. The team could give St. Petersburg notice of intent to move to Tampa before 12/31, even without a sealed deal for a new stadium. Without specific deadlines for leaving, it could buy the Rays more time to hammer out a deal with Tampa. The Rays did not return a request for comment. Commissioner Ken Hagan, the county’s lead negotiator on stadium issues, was not present Wednesday. He was in New York City attending a press conference announcing Tampa’s new XFL franchise. Commissioners also head from citizens on Wednesday concerned about a lawsuit that attempts to block the implementation of a one-penny transportation tax surcharge set to go into effect Jan. 1. 10Investigates broke the news Monday that the commission's most conservative member, Stacy White, is suing his own county to try and prevent collection of the voter-approved tax. He claims a citizen oversight board, created by the county charter amendment, usurps the commission's duty to allocate transportation tax dollars mandated by state statute. The referendum passed, 57 percent to 43 percent, on Nov. 6. "I pledge publicly," White said Wednesday, "to faithfully (do) my role in implementing this should a judge not agree with my stance." Other commissioners told 10News they were advised by the county’s legal staff not to comment on the litigation, but the county will have to hire outside counsel to handle defense of the case since White’s position as the plaintiff creates a conflict of interest for staff attorneys.